Lamb meat represents a highly digestible nutrition, even suitable for sensitive dogs. 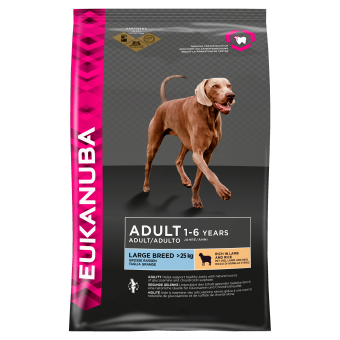 Eukanuba provides the optimal daily amount of protein, fat, carbohydrates, important vitamins and minerals for the health and well-being of your dog. This diet specially includes FlexMobility (Joint Management System) to nutritionally support healthy joint cartilage and a reduced fat level to help maintain optimal weight and minimise joint stress. Contains high-quality ingredients and high levels of animal-based protein. 100% complete and balanced nutrition for large and giant breed adult dogs with an average activity level and normal weight. Vitamin levels guaranteed until best before date.